You know how I'm a big fan of Shannon Cook's... everything? Well, her Feyre shawl is no exception. I've been keeping this worsted weight, marled yarn just for this project. All through the Christmas season it gently called to me, like a siren. By New Year's it was thumping like the tell-tale heart. I dutifully ignored it and worked selflessly on my son-in-law's sweater. So it's February and I can't stand it anymore. 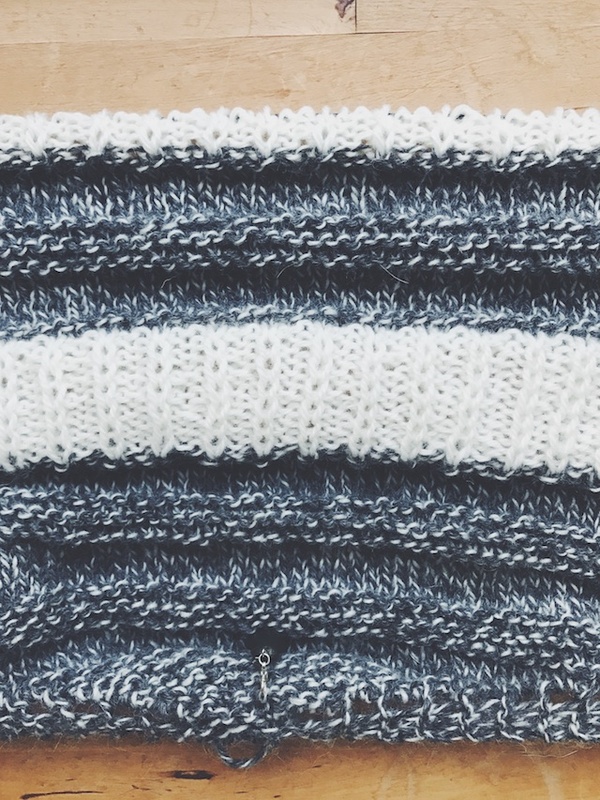 I've thrown open the closet doors and begun to knit this up. And, no, I haven't finished the sweater. Sigh. But it's The Year of Whatever I Wanna Do, Gosh so I'm knitting Feyre. It's an investment in my health because it's worsted, and so very relaxing. I've been working on it while watching tv. (The Closer, season 2 if I'm alone, or Baskets if my husband's with me. Have you seen Baskets?!? It's really funny, so far.) I'm recovering from a back sprain (?) and so I'm watching quite a bit of tv, with lots of standing, walking, and icing, too. It's also an investment in my future... the one where I live in the mountains of Tenessee, or something, and need warm clothing in the winter. 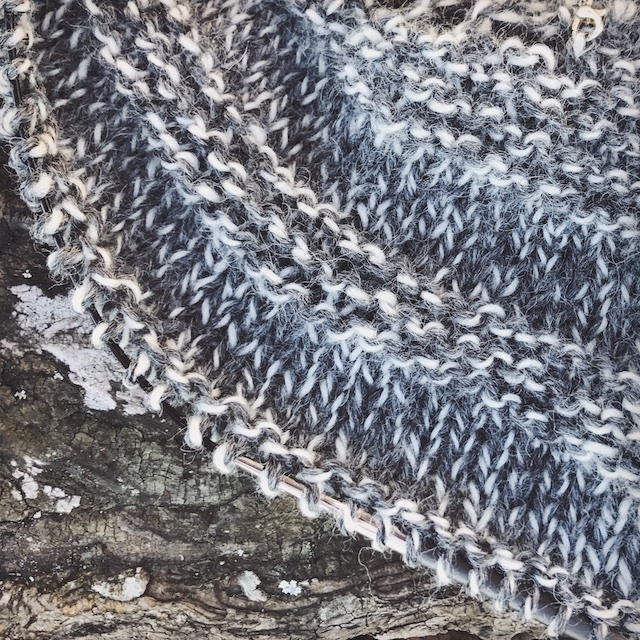 Shannon's sample is knit in Brooklyn Tweed's Shelter yarn, in the Newsprint colorway. It's a black and white marl and super graphic. I love it! I'm using Paton's Classic Wool in Dark Grey Marl because I'm cheap. It looks light grey to me, but it's still very pleasing to look at, and only a little sock monkey-ish. I got it in bulky and worsted for this shawl and a bulky Lila sweater, too. 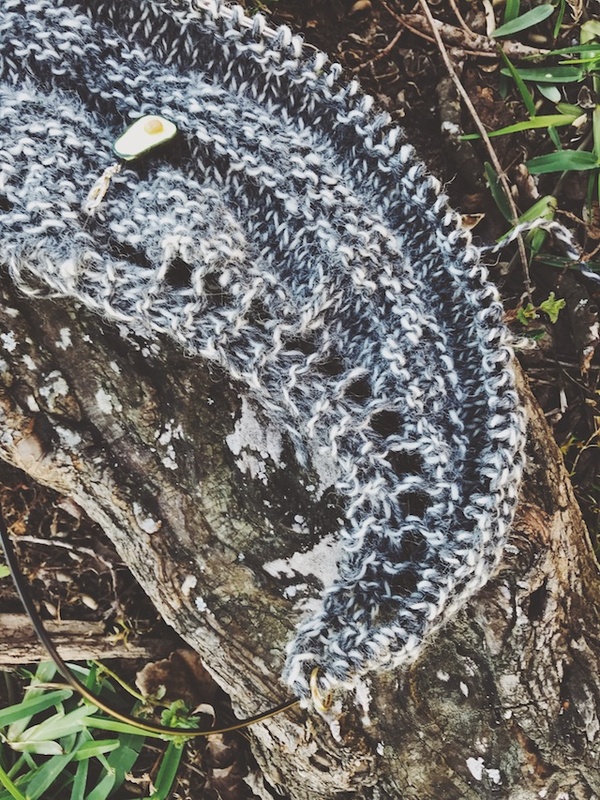 This thing is knitting up so quickly that I almost didn't post a WIP photo here, but I love watching it grow so much that I think it deserves a post. Plus, I'm trying to get back in the habit of regular blogging, even if it's just about stuff I'm making for a while. My husband thinks I should podcast. I told him my skin has to clear up first. That's a joke, but honestly, if you can't find time to blog how will you find time to upload podcasts? So just blogging it is. 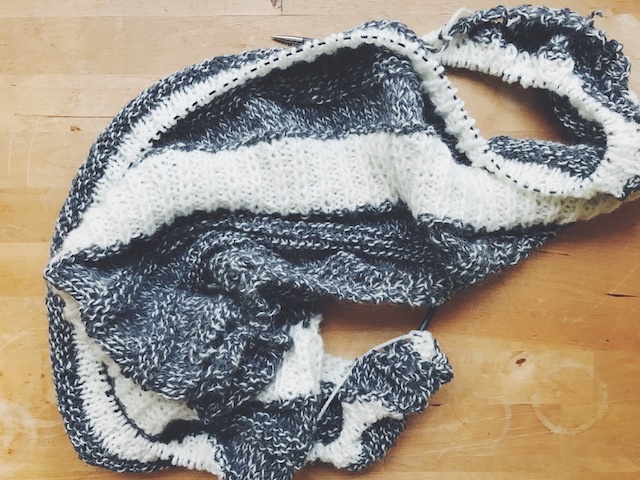 I am loving the gray and white so much I may start my Gather shawl next in Madelinetosh's Optic colorway and Hawthorne Kettle Dye in Blackbird. Maybe, cause I still have that Christmas sweater to finish. I'm knitting this as part of the Grocery Girls BFF Knit-along (Get it, cause Shannon and Jane Richmond are BFFs?) just because I was gonna knit it anyway. Remember, no pressure is my mantra for 2017.